От всего сердца поздравляем Вас с праздником. Поскольку в России уже много лет 8 марта является национальным праздником я, как и многие думаю, даже не задумывалась над его значением. Хотя меня всегда смущало то, что в то время как по всей стране мужчины дарили женщинам цветы, мой отец такие начинания резко критиковал, говоря — какой же это "Международный день" когда он празднуется только у нас, и что не будет его среди мужчин, которые раз в год, для галочки, сползают с дивана и тащутся в подземный переход к бабке с тюльпанами. Но, несмотря на авторитет родителя, я даже ребенком понимала, что не совсем он прав. Так как больщинство окружающих меня людей в этот день (как женщин, так и мужчин), просто сияют, преисполненные самыми светлыми чувствами. Плюс ко всему, должен же быть какой то смысл в слове "международный", почему не сделать просто -"Женский День"
Окозальсь, что 8 марта таки не было выдумано большивиками, а имеет длиннию и гордую интернациональную историю. Так что, девушки, гордо поднимите головы и примите букет! А если рядом нет любимого, купите цветы себе сами — вы этого достойны! --> is marked on 8 March every year. It is a major day of global celebration for the economic, political and social achievements of women. The first IWD was observed on 28 February 1909 in the United States following a declaration by the Socialist Party of America. The idea of having an international women's day was first put forward at the turn of the 20th century amid rapid world industrialization and economic expansion that led to protests over working conditions. Women from clothing and textile factories staged one such protest on 8 March 1857 in New York City. The garment workers were protesting what they saw as very poor working conditions and low wages. The protesters were attacked and dispersed by police. These women established their first labor union in the same month two years later. More protests followed on 8 March in subsequent years, most notably in 1908 when 15,000 women marched through New York City demanding shorter hours, better pay and voting rights. 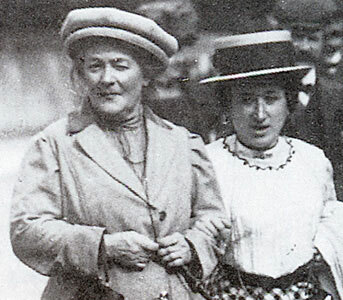 In 1910 the first international women's conference was held in Copenhagen by the Socialist International and an 'International Women's Day' was established, which was submitted by the important German Socialist Clara Zetkin. The following year, IWD was marked by over a million people in Austria, Denmark, Germany and Switzerland.Furthermore, on the eve of World War I, women across Europe held peace rallies on 8 March 1913. Demonstrations marking International Women's Day in Russia proved to be the first stage of the Russian Revolution of 1917. Following the October Revolution, the Bolshevik feminist Alexandra Kollontai persuaded Lenin to make it an official holiday, and it was established, but was a working day until 1965. On May 8, 1965 by the decree of the USSR Presidium of the Supreme Soviet International Women's Day was declared as a non working day in the USSR "in commemoration of outstanding merits of the Soviet women in communistic construction, in the defense of their Motherland during the Great Patriotic War, their heroism and selflessness at the front and in rear, and also marking the big contribution of women to strengthening friendship between peoples and struggle for the peace". However, it didn't have too much political flavor and was an occasion for men to express their love to the women around them — somewhat similar to Western Mother's Day and St Valentine's Day mixed together. The day remains an official holiday in Russia (as well as in Belarus, Kazakhstan, Kyrgyzstan, Macedonia, Moldova, Mongolia, Tajikistan, and Ukraine), and is observed by men giving the women in their lives flowers and gifts. In the West, International Women's Day was commemorated during the 1910s and 1920s, but dwindled. It was revived by the rise of feminism in the 1960s. In 1975, which had been designated as International Women’s Year, the United Nations gave official sanction to and began sponsoring International Women's Day. Today many events are held by women's groups around the world. The global women's organization Aurora hosts a free worldwide register of IWD local events (www.internationalwomensday.com) so that women and the media can locate local activity. Many governments and organisatons around the world support IWD. For example, HSBC hosts a range of IWD activity including co-hosting of the UK's flagship IWD event with women's group Aurora. Global interest in IWD shows a steady increase.